Lesser vasa parrots are lovely parrots, which are hardly ever seen in captivity. At first sight they don't attract people's attention because of their dark coloured plumage. However, if a closer look is taken, it cannot be denied that they are actually beautiful cute birds. In 1993, I started keeping both subspecies from Madagascar and since then I have become really enthusiastic about these parrots. The status in the wild is doubtful. It is likely the species is endangered in Madagascar as well as in captivity. I hope more breeders will take interest in lesser vasas and join the European Conservation Breeding Program. I love lesser vasa parrots; from all parrots they are definitely my favorite. Their plumage is always smooth. When sunlight reflects on their plumage a great variety in grey, black, brownish, and blue colours can be seen. Did you ever notice that they have a beautiful subtle black ear spot? Lesser vasa parrots are very lively birds. They do not scream like other parrots, but produce a tremendous variety of different whistling sounds, even short melodies. Therefore in Madagascar they are also called singing parrots. Unfortunately they sing quite loudly, especially during breeding the female continually beeps. Males and females in breeding condition often produce a sound that can best be compared with a car alarm at maximum volume, just for short moments and always fun. However some neighbours think differently about that! Lesser vasas can learn to speak and seem to be wonderful pets. I experienced two of my birds spontaneously started imitating sounds of my electric drill and vacuum cleaner, I noticed when I switched off the electric drill, and the sound didn't stop. My wife experienced the same with the vacuum cleaner. That's not exactly what I was waiting for, but amazing it was! Lesser vasas change beak colour. Normally the beak is black, but changes to white when they come in breeding condition. Also the cloaca swells up. 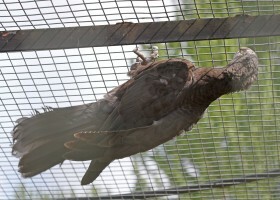 Lesser vasas can be kept as a flock, even in a small aviary and even during breeding season. Try that with other parrots of that size! Lesser vasas love sunbathing and take very strange positions while doing that. They even lie down on the ground sometimes. Lesser vasas don't really like to be touched, neither by humans nor by congeners. They don't show any form of affection towards each other and don't form loving couples. Lesser vasa eggs hatch at 14-15 days. Another 33-35 days later the youngsters leave the nest box. Lesser vasas don't demolish everything they touch. I keep them in a wooden aviary without any problem. Only during breeding season they like to chew a little wood and chalk. Lesser vasas mate while sitting next to each other instead of the male sitting on the female's back. Lesser vasas can stretch their neck to a remarkable length. When the birds feed each other the male stretches its neck at maximum length and bows gracefully forward first, before spitting in the female's beak with very fast and shaky movements. Two subspecies are found on Madagascar, the nominate form Coracopsis nigra nigra and the Bang's Coracopsis nigra libs. Coracopsis nigra sibilans is found on the Comores and Coracopsis nigra barklyi is restricted to Praslin Island in the Seychelles. The differences is between Coracopsis nigra nigra and Coracopsis nigra libs are very small and are seen best when birds sit next to each other. I shall not give a detailed description, but I will just mention the differences. I still haven't found any literature in which these differences are described in detail, so the following characteristics are based on comparing the 16 wild caught parrots I keep. Most of my birds I keep indoors. Birds in an outdoor aviary look different. Of course they show thicker feathers and their colours become somewhat darker, Coracopsis nigra libs sometimes more brownish. Underneath I describe the differences when the birds are kept in an indoor aviary, compared at daylight and during the time of the year the beak is white. Determining the subspecies is complicated. Even more while the two subspecies mix up in the North and South of Madagascar. So natural hybrids exist. Also amongst my wild caught birds there are some specimens that I recognise as possible hybrids. I have a very dark coloured male, not distinct from Coracopsis nigra nigra, however with a blue rump. I also have some very dark coloured Coracopsis nigra libs, hardly distinct from Coracopsis nigra nigra. Nothing is known what lesser vasas from Madagascar eat in their natural habitat. I try to buy many fruits that also grow in Madagascar like mango, papaya, figs, banana etc. However tropical fruits are relatively expensive and it is not necessary to supply these kinds of fruit every day. Fortunately lesser vasas eat almost everything. I experienced they prefer eating seeds basically. I mix a standard seed mixture for parrots together with a standard mixture for cockatiels without sunflower seeds, ratio 50:50 this I supply daily. I don't supply many seeds containing lots of fat. Therefore, I provide a limited amount of sunflower seeds and I never give peanuts. Every 2-3 days I supply fruits; they love grapes, apple, pear, and mango in particular. They also eat melon, strawberries, rose berries, and vegetables like carrots but are not fond of salad. They also love boiled rice. During wintertime you can't leave the fruits from their menu. I tried to accomplish synchronising breeding condition with that I tried that once for a couple weeks, but all birds caught a cold due to a decreased physical resistance. The amount of fruits and protein provided influences the process of coming into breeding condition. I noticed this for several years now. As soon as the first birds start to show white beaks as a sign they are about to come in breeding condition, I provide egg food and fruits daily. Once or twice a week I supply boiled rice with a few cat pellets as well then. Soon the other birds will follow. If the diet is not changed, the birds can come in breeding condition in very different times of the year. Diet is not the only factor involved, but it is a main factor I experienced. When birds are breeding they consume extreme quantities of food. One pair can eat 1 kg grapes a day beside their standard daily amount of food. Especially when there are babies in the nest they need lots of (animal) protein, more than other parrots. I assume the amount of protein supplied during the first weeks has great influence on development in growth. Last year I went on holiday when the birds had just left the nest. Friends of mine, who took care of the birds for 3 weeks, forgot to supply egg food. The young birds didn't grow to maximum size. Young birds I bought in Madagascar were given only boiled rice. Those birds didn't grow to maximum size neither. My birds born in 2001 have become huge. The following notes are based on my personal experience. This will not mean that different behaviour is excluded. 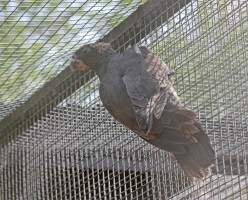 Lesser vasa parrots can be kept as a flock, even in a small aviary. Although I didn't have breeding results then. In the group pairs are not formed spontaneously. Males and females often don't come in breeding condition all together at the same time. This is equal to nigra and libs. Fortunately I keep more than 20 birds in totality, so there are always some males and females with an overlapping period of breeding condition. The reason why it took so long before I had my first success was that I avoid crossbreeding both subspecies and that I started with a limited amount of birds. With (natural) hybrids I don't want to breed. Neither libs nor nigra pairs came in breeding condition synchronously. In 1993 I started with 2 birds. 1 libs and 1 nigra, both females. In 1995 I could buy 5 more birds and in 2000 I bought another 9 birds. All those birds are wild caught. In 2001 one pair libs gave birth to 2 young for the first time and in 2002 another pair libs produced 3 young. 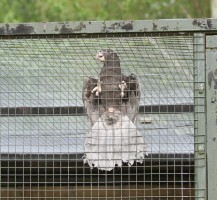 Because of a lack of space to build more aviaries I have to keep some pairs at other breeders. This will probably reduce the chance on breeding results, while I am not able to switch pairs in time. My lesser vasa parrots only accept large nest boxes, a size suitable for cockatoos. I built two 8-angle, almost round nest boxes, diameter 50 cm. height 65 cm. I placed the nest boxes on a stand. One stand was covered at the front side, so it looked like a hollow trunk. The nest opening diameter needs to measure 10 cm minimum. In breeding time I separate pairs of equal colour when females are in optimum breeding condition. The female becomes very dominant, but will not really attack the male. She is begging for food continually and hunts the male all day. The skin colour of the female's throat and forehead changes to yellow-orange. She is getting very nervous and starts chewing chalk. Right after the first copulation she is about to lay her first egg. I think every egg has to be fertilised separately. I noticed after every copulation an egg was laid a couple of hours later. 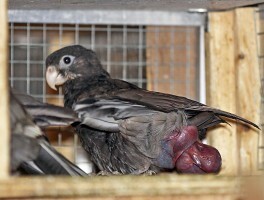 The female starts sitting from the first egg. The 2001 pair laid four eggs all of which hatched after 14-15 days. The 4th young didn't survive while the others took all the food. It died after approx. 20 hours. I wasn't at home in time to take the bird out for hand rearing. The female leaves the nest box regularly to be fed by the male. She hardly consumes food from the food bowl. Nest box inspection was quite easy. I didn't have to disturb the female from the nest. I made the inspection door of the nest box on the outside of my aviary, inside my house. So I didn't have to enter the aviary for inspecting the nest. The baby birds left the nest box 33 -34 days after the eggs hatched. The baby birds grow very fast. Leg rings have to be placed at the age of 8-9 days, I used ring size 9 mm, but 8.5 mm (and perhaps 8 mm) will be suitable too. I never measured the legs of adult birds because I hate to catch my birds. Catching birds causes lots of stress in the group and it takes very long time before the (wild caught) birds are relaxed again. Not much is known about the birds in their natural habitat. The species is not studied very well in the field nor in captivity. Only poor reports are published in literature and copied many times. More attention has been paid to greater vasa parrots. It seems that lesser vasas are somewhat forgotten. When I visited Madagascar for holidays in 1995 I tried to observe lesser vasa parrots in the wild in passing. I have been travelling through the northern half of Madagascar for 4 weeks together with my wife and a friend of ours. We started our journey in the capital Ananarivo (Tana) and drove to the East coast (up to Tamatave). When we couldn't cross the delta, we drove back to Tana. Then we drove to the West coast up to Maveatanana and crossed the mountains in the north to the East coast again. From the East cost we went around the North to Ankarana Mountains and then via the West coast we drove back to Tana again. Madagascar is rather a dry country. The northern East coast is rather green, but at the West coast there is not much forest and the area is very dry. Near the sea there are areas with mangrove forest. Around Ankarana Mountains there is a little piece of forest consisting of ficus trees mostly. In this forest we camped a couple of days. Every morning a trio of greater vasas and a group of lemurs (coronatus) woke us there. Lesser vasa parrots were not seen nor heard. Deforestation is a major problem in Madagascar. Deforestation is not just caused by humans but is also due to hurricanes. Forests, and therefore nesting trees disappear rapidly. Of great concern is that there is not much forest left. During our entire journey I saw lesser vasa parrots in the wild only twice, while greater vasas were seen much more frequently, however not in the highlands. Local people and animal traders confirmed my supposition that lesser vasa populations disappear rapidly, not just in the north, but also in the south of Madagascar lesser vasa parrots become rare. Still a lot of vasa parrots are exported. In 1995 3,000 greater vasas had been exported already in November. Fewer lesser vasas were exported just because catchers couldn't find so many; otherwise probably 3,000 lesser vasas would have been exported too. The rapid deforestation and the great numbers of birds that have been exported from Madagascar in the past, in spite of there are not many left over in captivity make me believe that without a conservation breeding programme the species will be extinct within a couple of years. Since the very beginning I keep lesser vasa parrots I have tried to contact other breeders who keep this species. In the Netherlands, where I live there were just a few breeders. Since 1998 I tried to establish a conservation-breeding programme. In 1999 Tom de Barbanson, a friend of mine became enthusiastic about the idea and the Dutch Conservation Breeding Program became fact. Unfortunately we couldn't find many members in The Netherlands, so I started searching for breeders in other European countries and USA. At the end of 2000 I met Rosemary Low and told her about my plans for a conservation-breeding programme. She was very enthusiastic and placed an announcement In Cage and Aviary Birds magazine in January 2001. In 2001 I contacted Jorg Asmus, a breeder in Germany and member of bird society VZE. He suggested letting VZE co-ordinate the European conservation-breeding programme. I agreed, because a bird society (VZE has more than 3000 members) probably can achieve more than just a few private breeders. The European Conservation Breeding Programme for lesser vasa parrots was born and is co-ordinated by VDE's Dr. Georg Sauer. We have more than 20 members now in Germany, Netherlands, UK, Sweden, Belgium. Spain, Switzerland, and Portugal. Even some zoos and bird parks joined the programme. All Coracopsis nigra subspecies are present in the programme, however breeding results were poor last year. Avoiding the species becoming extinct in aviculture. If we are able to breed more lesser vasa parrots the demand for imports will hopefully disappear. If we are able to breed the subspecies pure, we are also able to provide birds for reintroduction in their natural habitat if this will happen to be necessary in the future. With the studbook we try to avoid inbreeding. Exchanging information and experiences is very important. 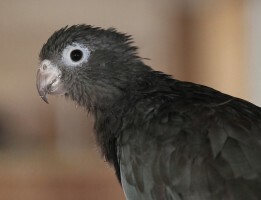 Very few people keep lesser vasa parrots and even fewer people breed them, due to a lack of birds and a lack of knowledge. The more members we get, the bigger the chance the species will survive. Joining the programme is free of charge. We don't demand for contribution. Information will be send per e-mail, Members without an e-mail address are informed per post. We try to send our members a newsletter every 3 months. All information provided by our members is handled confidentially by the co-ordination team only. Within the programme addresses nor other information will be forwarded without permission in black and white. At the moment we are doing literature studies and studies after subspecies by visiting museums that own conserved dead bodies of Coracopsis species. For this year we plan to start an Internet group for our members and create a website for our programme. We think about integrating Coracopsis vasa in the programme in the future. This depends on the amount of work we get with Coracopsis nigra and the interest of Coracopsis vasa breeders for it. AKJ 2018 - articles like these describing the practicalities and pitfalls of breeding parrots in captivity are of great value to other like-minded members of the Society.